The highlight of yesterday’s programme at the Marsa Racetrack was the Republic Day Championship final for Premier Class trotters on a long distance of 2,640 metres. This final, won by Vejby Boom, formed part of the 45th meeting of the season, made up of 10 races all for trotters. Six of these races were finals to commemorate the 40th anniversary since Malta became a Republic. The Premier final was contested by 12 horses. It was Schwerin Boko (Rodney Gatt) which set the pace, opening a half-length lead from Wiss Roadrunner (Mario Farrugia) and Gently Di Poggio (Brian Hili). But, with 300m to go, Schwerin Boko ran out of steam and, in the final straight, was overtaken by four trotters. It was Vejby Boom (Charles Camilleri) which had to go all the way in order to stave off the challenge of Veikko Hornline (Julian Farrugia) and Tap Dance (Michael Ellul). Carmen Sund (Kurt Saliba) finished fourth. At the end of the final, Parliamentary Secretary for Sport Chris Agius presented a commemorative plaque to Charles Camilleri and Dione Calleja, the driver and owner respectively of the winning horse. For Vejby Boom this was its fourth win of the season. The other finals were open to horses from Gold, Silver A, Silver B, Bronze and Copper Classes. In the Gold final, favourite Nico Oland (Julian Farrugia) took the lead midway through the distance. This nine-year-old trotter ran untroubled up to the finish line to secure its second consecutive win by three lengths from another trotter imported from Denmark, Obelix Molgard (Salvu Vella), and Wies Buitenzorg (Eric Bezzina). Robin Du Suret (Cliferty Calleja) was fourth. Yesterday’s card also included a pony race final on a short distance of 1,140 metres. This was won by Shelgar, driven by George Falzon. 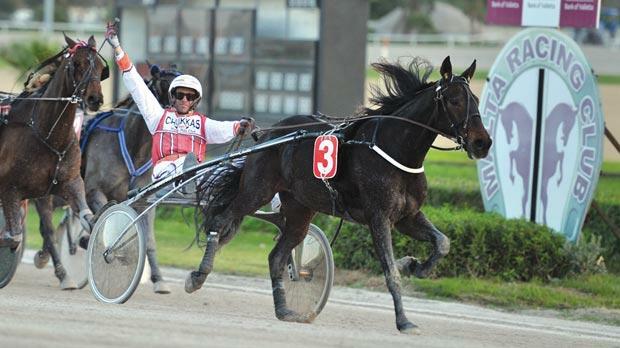 Today’s meeting at the Marsa Racetrack, starting at 3.30pm, features five finals for French trotters. Race 1: Bronze, Andri Boko (Tony Demanuele) – 1.17.7”. Race 2: Gold, Lover Roc (Jurgen Attard) – 1.16.2”. Race 3: Republic Day Championship (RDC) final, (Copper), Silvio Baldwin (Mario Falzon) – 1.19.5”. Race 4: RDC final (Bronze), Roc Du Bois (Rodney Gatt) – 1.18.6”. Race 5: RDC final (Silver B), Roc Magister (Kirsten Axisa) – 1.16.6”. Race 6: RDC final (Silver A), Roma M (Paul Galea) – 1.17.4”. Race 7: RDC final (Gold) Nico Oland (Julian Farrugia) – 1.17”. Race 8: RDC final (Premier), Vejby Boom (Charles Camilleri) – 1.18”. Race 9: Gold, Markus Klipp (Darren Mizzi) – 1.16.5”. Race 10: Bronze, Zwinger Bobber (Rodney Gatt) - 1.18.3”.